We installed a BS 9251:2015 residential fire sprinkler system at Dexion House, Wembley. The building is a redevelopment of a 1960’s office into premium student accommodation. All rooms were constructed using a steel framed modular system which enables off site manufacturing which is then delivered and installed to site. This method of construction reduced the construction time to just 12 months. The sprinkler system was installed at the factory, our engineers then attended site once the modular system was installed to connect up all the pipework, install corridor pipework and commission the system. 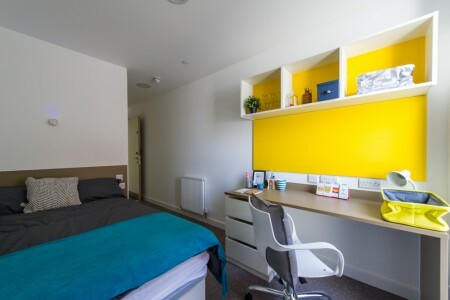 Sprinkler protection was provided to Blocks A & B to all 802 student bedrooms, cluster corridors, laundry rooms, common rooms, escalator hall and kitchens. We have also worked with Tide Construction at Karma House and Sherwood Court using the same construction methods.